Promotional Products & Marketing Blog » Promo, Brand & Marketing News » Finally, I Can Start Spelling it Katsup Again! 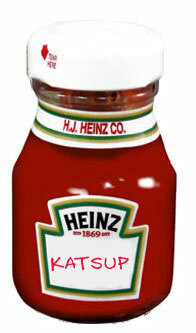 Heinz recently started giving people the option to custom imprint their ketchup, which means I can finally start buying Katsup again, or Catsup for that matter. I was alerted to this development by the good folk at the MIT Advertising Lab, and Steven Colbert has already been getting some mileage out of it as well, so don’t forget to send custom ketchup bottles to your congressperson demanding that we go back to serving “Freedom Fries” in the congressional dining hall. Someday, we will hopefully be able to customize the shape of our condiment bottles, too. In the meantime, you can also get yourself some custom sauce right here at ePromos.